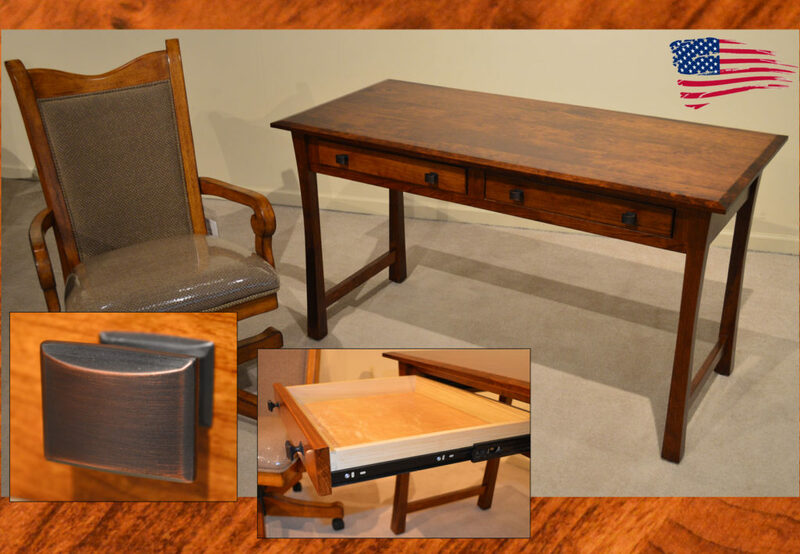 Amish Cherry Desk features soft curved and simply styled legs, solid cherry construction, 2 full extension glide drawers, beveled edge on top, and oil rubbed bronze hardware. The desk is available for order in, but not limited to the following species of wood: oak, maple, cherry, elm, quarter sawn white oak, and walnut. The desk can also be ordered in any size and custom configuration you wish. Made in USA! features smooth opening full extension tracks for long lasting use, catalyzed finish for an exceptional lifetime durability, and a plethora of style, finish colors, two tone options available, custom sizes, custom shapes, custom edge detail, and wood specie options in solid (oak, maple, cherry, rustic cherry, tiger oak (quarter sawn white oak), rustic tiger oak, tiger maple, walnut, grey elm, hickory, hard maple).